Without technology, much of the work advisors do wouldn't be possible. But as helpful as technology is, the sheer number of options can be overwhelming. The most successful advisors know which tools to use to best serve their clients and understand how to most effectively leverage technology to build a better business. 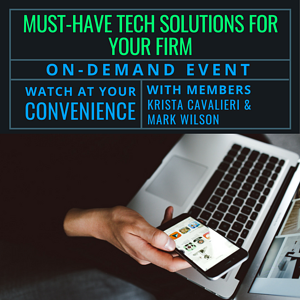 In this free webinar, XYPN members Mark Wilson and Krista Cavalieri share the must-have tech solutions that will help take your firm to the next level. Learn how to successfully deploy technology within your practice to solve issues and achieve the outcomes you want. This call is ideal for anyone considering XYPN membership. How much did you spend on technology in your first year? What tools can I use to manage my client's portfolios with scale WITHOUT using TAMPs? How do you handle secure client communication? For in-person meetings, what is the best way you have found to present planner materials electronically? What do you use for you admin/backoffice tech needs? Compliance, CRM, archiving? What tech options outside of what XYPN offers are a "must have"? Krista Cavalieri, CFP®, started Evolve Capital when she realized there was no way for young people—like her—to get good financial advice tailored to them. She isn't interested in one size fits all financial products or minimums that most people can’t reach. Instead, Krista brings financial planning to the next generation that shouldn't be ignored just because of their age. Mark Wilson, APA, CFP®, founded MILE Wealth Management to provide real wealth management to families and “Make It Look Easy” (MILE). Providing integrated financial planning and investment management is hard. Mark's goal is to use his experience, teaching background, wise use of technology and smarts to make it look easy.